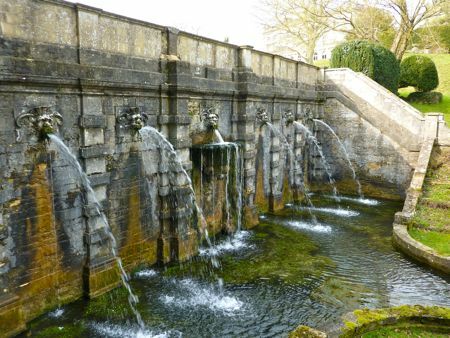 A couple of Thursdays ago, wanting to take advantage of the recent sunny and warm weather, Jon and I called up Cowley Manor in the Cotswolds to see if they had any last-minute specials for the weekend. The good news is that they had a few “Better” rooms available. 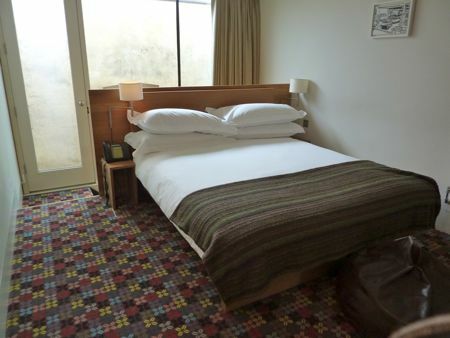 The bad news was that these rooms weren’t offered on discount and still cost £385 a night. (What happened to the general hotel practice of lowering prices to fill an empty room?) Instead, Cowley agreed to waive its two-night minimum stay requirement, so we could arrive on a Saturday morning and make full use of facilities both that day and Sunday. When Jon and I visited Cowley Manor last August, we’d tried out the “Good” rooms (the cheapest ones available) for £250 a night. I was pretty happy with the room we had, which was in the Main House and had views of the beautiful back gardens. 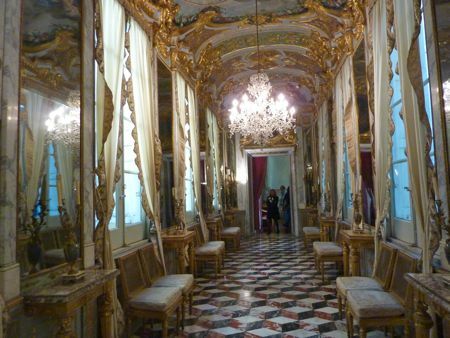 The “Better room,” while more expensive, wasn’t as appealing as the “Good” room, I thought. For the additional money, a Better room got you a suite spread over three floors, including your own sitting area. I’m not sure who values having their own little sitting area, but it wasn’t me. 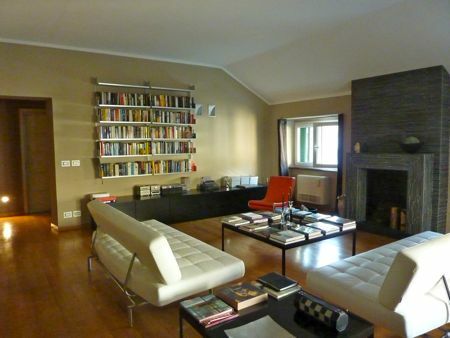 I’d much prefer to take advantage of the large, stylish “common area” sitting rooms in the Main House. The other reason I wasn’t keen on our Better room is its location in the converted stable blocks, which by definition lack the Main House’s heaps of character. So if you’re deciding between the “inexpensive” Good rooms and the pricier “Better” rooms, I say take a Good room and spend your savings on an extra spa treatment. 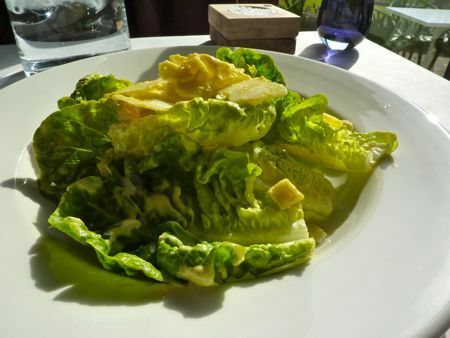 On our last visit to Cowley Manor’s restaurant, we thought the menu offerings were fussy and not well executed, so this time we kept most of our meals simple. 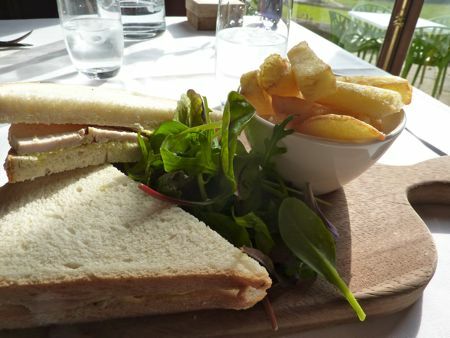 Sandwiches, chips, salads were all simple, freshly made, and good value at less than £6-7 an item. Breakfast was lovely, partly because whoever supplies Cowley Manor with its croissants is a master. We would’ve skipped dinner in the restaurant, but because it was included in the price of our room, we didn’t motivate to leave Cowley for a meal elsewhere. The food was just as fussy and unimpressive as we remembered from last August, with the low point being dessert. I asked the waiter if the “cinnamon donuts” were freshly fried, and he replied that they were and highly recommended them. I also asked if the accompanying “apple crumble sorbet” could be replaced with just plain vanilla ice cream, and again, he swore the apple crumble sorbet was not to be missed. Sadly, our waiter was 100% wrong on both fronts. The donuts were hard as a hockey puck. totally bizarre, and honestly, a 50p bag of Tesco donuts would’ve been superior to what I was served. The apple crumble sorbet was watery and gritty. Just awful. But food isn’t Cowley’s strong point. 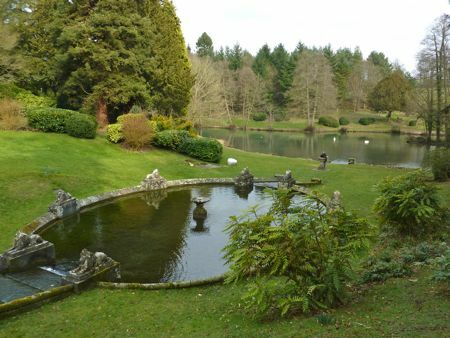 The grounds and spa are. Taking advantage of the lovely weather, we did lots of walking around the gardens, which have both manicured bits and wilder bits. Key for getting through the wilder, muddy bits: wellies. 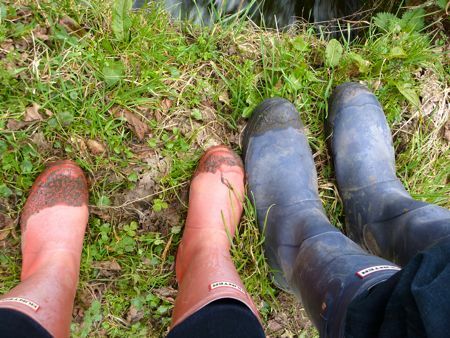 Lots of wellies in every size are made available for guests. Definitely a great, practical novelty for us Londoners. 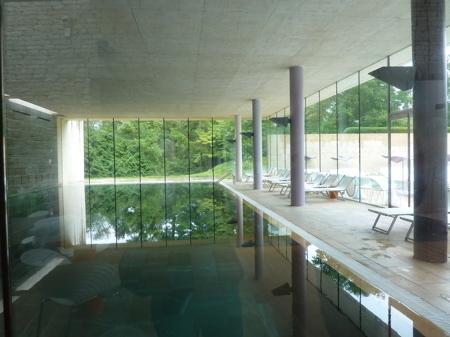 And of course, the Cowley Manor crown jewel: the spa is as peaceful and pampering as ever. Treatments are long and relaxing, and all the staff super accommodating and attentive. 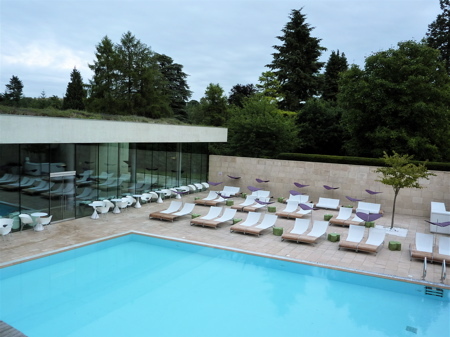 If you’re looking for a lovely country getaway, it’d be hard to surpass Cowley Manor. Ideally you drive there so you can sample food in nearby Cheltenham, though, and while you’re at it, save yourself the train and taxi fare, which add up. 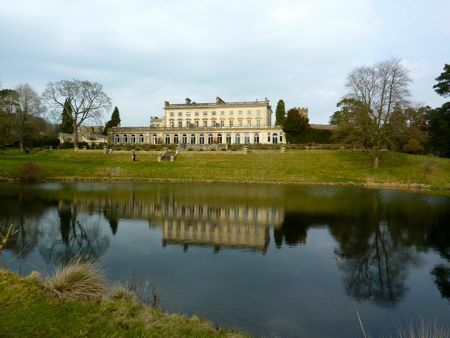 Cowley Manor, Cowley, Gloucestershire, GL53 9NL; (0)1242 870 900; reachable via First Great Western train from Paddington Station to Kemble Station (1.5 hours or less depending on whether you have to switch in Swindon) and about £40 per roundtrip ticket. Then a 30-minute taxi ride costing £35 each way. Antiques market near Place de la Republique. 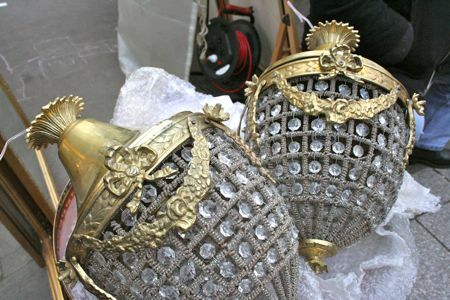 "I just happened to have these lying around in my house." Often you hear that there’s nothing like Paris in the springtime. But actually, I’d say there’s nothing like Paris for the winter sales, which generally run from early January to mid-February. Wait for the first couple of weeks to pass by. The crush will have died down in most stores, and many things will be on secondary markdown. Although price tagging is haphazard at best and some of the fancier stores make you ask which items are on promotion, the bright-colored SOLDES signs everywhere is, to my mind, very festive. And if I haven’t mentioned it before, in general, if you’re looking for a well-edited and up-to-date list of restaurants in Paris, you can’t beat the “Editors’ Pick” feature of Paris by Mouth, a collective effort by well-established food writers and bloggers in Paris. 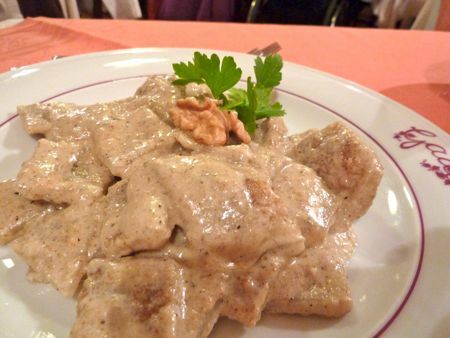 Our favorite meal this time round in Paris? Dinner at Rino. 4 courses for 38 euros and 6 courses for 55 euros. Go for the 6 courses. You’ll get a nifty offal dish and a cheese course. The dining room is super casual and lively. Most diners seemed to be in their 30s and 40s and having a rollicking good time. A great place to visit with friends. The food was delicious and creative. Our dinner started strong: potato tortellini with a hint of lemon, served in salty smoked fish consomme, with hits of sweetness from onion and bites of octopus. So many subtle flavors with each bite. I definitely wasn’t expecting that sort of sophistication given the casual atmosphere. 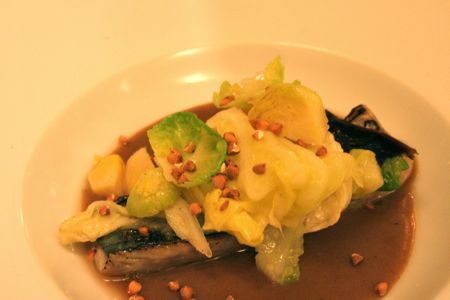 Fillet of mackerel in a bread soup was firm and meaty, and I loved the addition of sweet cabbage and nutty brussel spourts with tiny breadcrumbs for texture. Rabbit kidneys were a tad rubbery but visually fun to see them on a skewer with similarly-sized escargot. 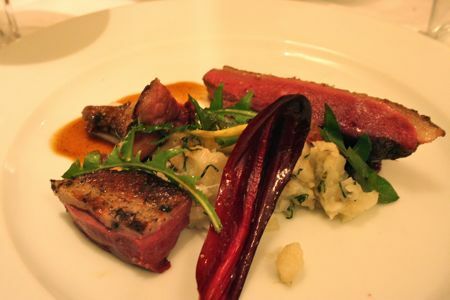 Duck course was outrageously bloody but delicious. Cheeses were well chosen, and our dessert was simple and refreshing: a bergamot-scented semi freddo-covered fresh fruits, dried fruits and candied nuts. Service was super attnetive (we must have gone through at least six carafes of tap water). Bonus points for being within walking distance of the hotel we always stay at, the much-loved Grand Hotel Francais. Rino, 46 Rue Trousseau, 75011 Paris, +33 (0)1 48 06 95 85; closest metro stop: Ledru-Rollin (8). 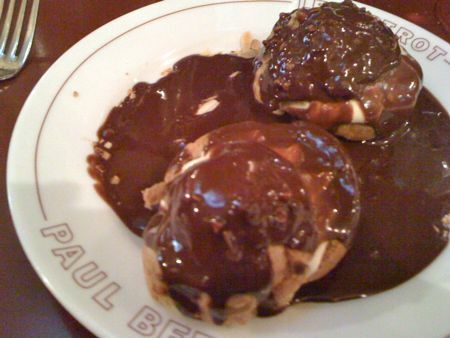 It may be listed in every english-language guidebook and blogged about repeatedly, but I suspect that because of its location in the 11th arrondissement, Bistrot Paul Bert still feels like a local joint. Jon and I turned up for Friday lunch without a reservation, and it was pas de probleme to find a table. As is the case with most places in France, the 3-course prix fixe lunch menu (16.50 euros) was incredibly good value. Bonus points at lunch for my learning a new word in French: topinambour. Jersualem artichoke. Highlights of our lunch: the rich cream of topinambour soup, perfect for a winter’s day; the roast lamb, served with incredible char and juicy, pink meat; and a heaping huge serving of chocolately profiteroles and cheese. Simple, classic, well-executed bistro food. I tried to sneak a side order of their famous frites into our order, but our waiter replied: “je ne vous promets rien” (I promise you nothing), and of course frites never arrived. Can’t win ’em all. It’s no exaggeration to say I’d been looking forward to eating at L’Agrume for at least the last 12 months. Great pedigree; rave reviews. For a sampling of the hype, read John Talbott’s January 2010 rave review, and of course this April 2010 blurb in the New York Times. In any case, our dinner there was nice, but not what I was hoping for, which was something more like what we had at Rino – creative fare at good prices. We weren’t keen on the prix fixe menu (reasonably priced at 35 euros), so we choose from the a la carte menu, which was much pricier, with starters hovering around 15 euros and mains generally in the low 30s. L’Agrume was generous with luxury ingredients (Jon’s starter was packed with crab meat, and mine with lobster meat), but didn’t seem to do much with them. And while I did, in fact, devour my veal chop (and Jon the same with his fillet of Dover sole), neither dish was prepared with any sort of twist. I wish I’d read this Gourmet Traveller June 2010 post before going to L’Agrume, because she’s right on the money to say the food didn’t seem like anything you couldn’t cook at home. Based on our visit, L’Agrume seems to be a strong choice if you want large portions of tasty, straightforward cooking in a casual setting. The place was still packed at 10 pm on a Friday night, so the atmosphere is nice and buzzy. We were especially happy with the wines-by-the-glass options. 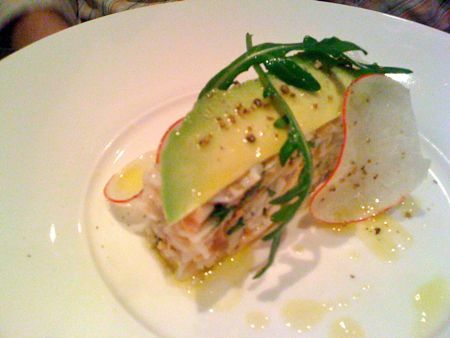 But if you go, know that the a la carte gets pricey. Ahh, Sundays in Paris. I’ve stopped bothering trying to book restaurants. There are so few good ones open that day, and because most boulangeries and places in Chinatown stay open on Sunday, I find that planning on baked goods and banh mi is a something to look forward to. On this particular trip, it was the weekend after Chinese New Year, so Jon and I headed to the Right Bank Chinatown around Belleville to rustle up some dim sum (“cuisine a la vapeur” en francais). We took a recommendation from Clothilde Dusoulier’s “Edible Adventures in Paris” and sought out “Le Pacifique.” And you know what? It sucked. Possibly the worst dim sum meal I’ve ever eaten in my life, and you know I’ve eaten a lot of dim sum. I’ll let the above photo of stodgy, *deep fried* and radish-and-pork-less loh boh gao represent what our dim sum meal was like. And each steamer still cost 4.50-5 euros, which I’d hesitate to pay even at a Michelin-starred place like Yauatcha or Hakkasan, much less at a greasy-looking spot surrounded by French people ordering nems. Avoid like the plague. 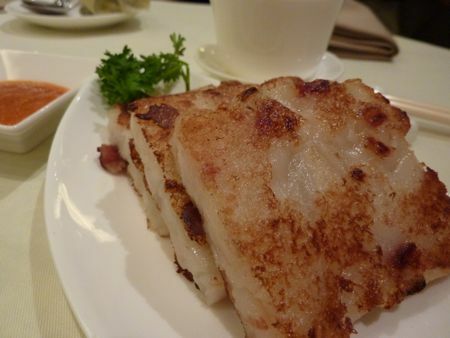 If this is the best Paris has to offer by way of dim sum, then I weep for Parisians. For your Asian fix in Paris, stick with the Vietnamese food. 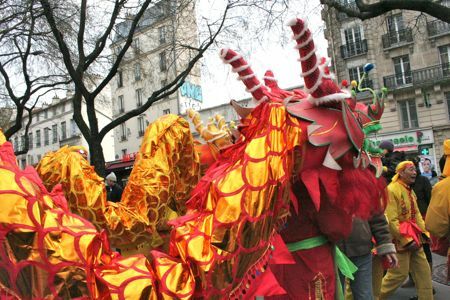 On the plus side, we bumped into Chinese New Year dragon dancers on our way down the street to pick up banh mi at the reliably-delicious Dong Tom/Panda Belleville banh mi takeaway shop. 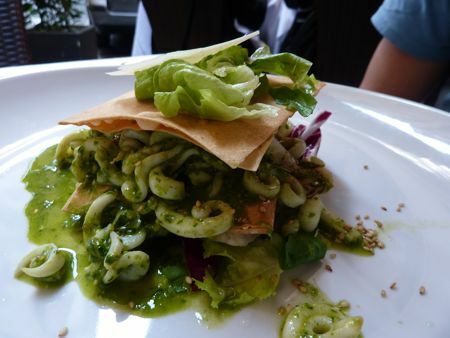 Le Pacifique, 35 Rue Belleville, 75019 Paris, +33 (0)1 42 49 66 80; closest metro stop: Belleville (11). Dong Tam (Panda Belleville) banh mi, 16, rue Louis Bonnet, 11th; closest metro: Belleville (11). Not food related, but just a brief note that Jon and I have started to make trips to Paris to coincide with the First Sunday of the month. Free museums. 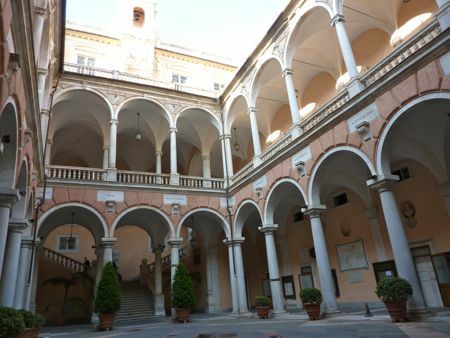 Whereas I wouldn’t pay another 12-15 euros to visit a museum for the third, fourth, fifth time . . . for free, I don’t mind popping in and out to see a few faves and move on. I love it. This time around, the weather was sunny, so we revisited the Rodin Museum, which has lovely sculpture gardens, of course, and is a manageable size. 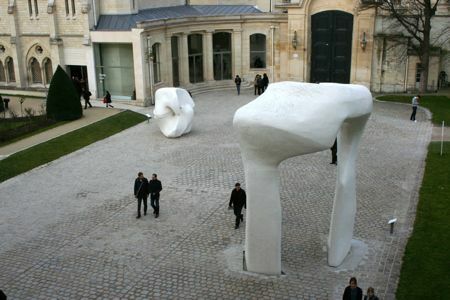 There’s a Henry Moore exhibit going on as well, so in case you haven’t had your fill of those, you can get two big-name sculptors for the price of one if you head now to the Rodin Museum. Musee Rodin, 79 Rue de Varenne, 75007 Paris; +33 (0)1 44 18 61 10; closest metro stop: Varenne (13). Everyone has their favorite place to stay in Paris, I know, but I can’t say enough good things about the boutique hotel, Le Grand Hotel Francais. We’ve been staying here on every trip to Paris since reading positive TripAdvisor reviews about it in 2008 (maybe since 2007, even?). 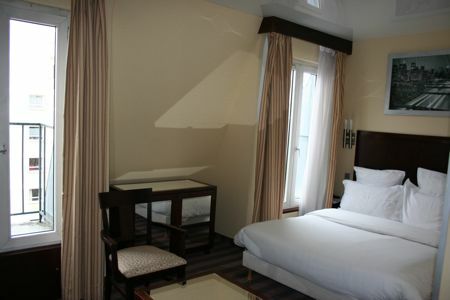 The rooms are great value for Paris – clean, modern, comfortable. The hotel owner, Zyad, is incredibly hard working and friendly, and despite the hotel’s recent recognition by TripAdvisor as one of the top 25 hotels in France, Zyad is still at that front desk, working 90 hours a week to make customers feel welcome and cared for. At this point, I look forward to seeing Zyad every time we’re in Paris, and so in the interest of full disclosure, I’ll share that sometimes, like this time, Zyad upgrades us to higher-floor, larger rooms when they’re available. But he did that for us the second time we stayed there, long before we were what you’d call “regulars.” And even when rooms are full and we end up in a ground floor room, I think paying 110-135 euros a night (depending on the time of year) is still good value. I’m also a huge booster for the 11th arrondissement, in general, especially if you’re a food lover and want to explore a pretty but non-tourist-fied neighborhood in Paris. Night markets are a feature of many Southeast-Asian cities (well, definitely cities with large Chinese populations, anyway), and while I appreciate the beauties of a sunny daytime market in, say, France and Italy, in my opinion, night markets are the best of the market genre. First, they’re practical. When you’re in a hot, tropic climate, it makes sense not to go out until dark, and after being cooped up in air conditioning for much of the day, being outside again is a heady release. Second, there’s a liveliness that only nighttime brings. The carefree and festive atmosphere of night markets is hard to match. In Taipei, night markets open at around 4 or 5 pm, but they really don’t get going until 8 or 9 pm, when families and friends meet up for a stroll, some shopping, and/or a bite to eat. Shilin night market in Taipei isn’t the only night market in town, but it’s the biggest. You could happily shop or play carnival and arcade games there for days. I, of course, go for the food. I was last at Shilin night market in 2002, and the major change today is that there’s an enormous covered tent now that houses the majority of food stalls in one place. It’s certainly convenient, but it means you can expect an unbelievable human traffic jam at around mealtimes. I already talked about the brilliant jian bao in my previous post about dining out in Taipei, generally. These are a must-have. Zen bing. They’re a Chinese burrito. 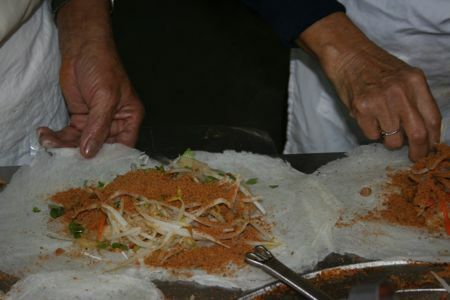 You take a thin flour-based shell (almost like an eggroll skin), and you get it stuffed full of goodies like Chinese sausage (which is sweet), roast pork, fresh bean sprouts, sliced up egg omelet, scallions, crushed peanuts and a little chilli sauce. For normal people, a zen bing constitutes a solid meal, for less than $2. For me, ’twas but another snack. 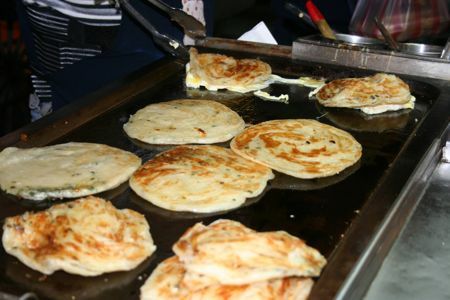 Scallion pancakes (tsong you bing) are great. But throw on a layer of egg and eat it hot off a griddle, and it’s even better. That’s a dan bing. They’re commonly eaten as a brekkie-on-the-go in Taiwan, but in my humble opinion, they’re good at all hours of the day. Much like breakfast foods, generally, yes? 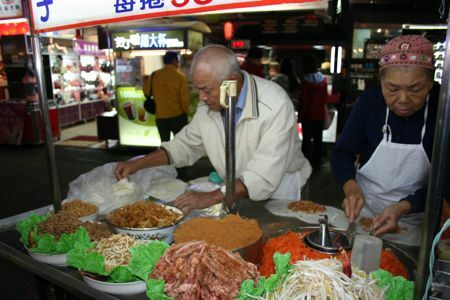 Hot Star is one of the more famous stalls in Shilin night market. There are at least two stalls in the market, in fact. For 55 NT (less than $2), you get an *enormous* wedge of what appears to be schnitzel (chicken breast pounded thin, breaded and fried). Bite into it, though, and you’ll know this thing is all Chinese. The spices. A little star anise, a hint of cinnamon, some turmeric and fennel in there, too, I think? I must confess that I should have shared this one with someone. I made the strategic error of eating one on my own, which left scant space for the dozens of other goodies on offer at the night market. 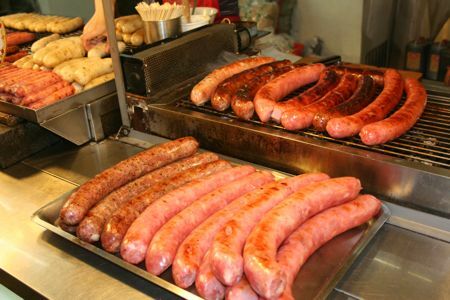 Chinese sausages. 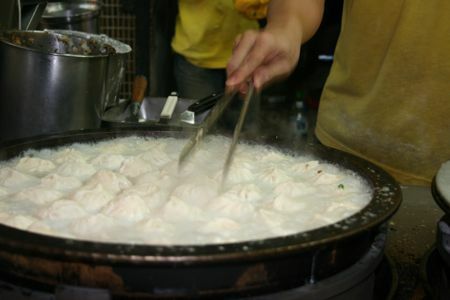 The ones at Shilin night market are famous, though I suspect it’s because they’re so large. 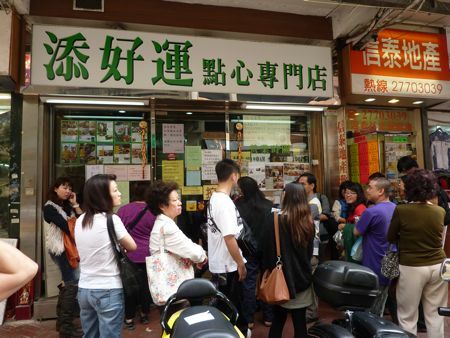 If you’ve never had a Chinese sausage before, this is a good place to try them. For me, it was just a Chinese sausage. Sweet, porky, smoky. Good stuff. Last but not least, owa jen. The oyster omelet. 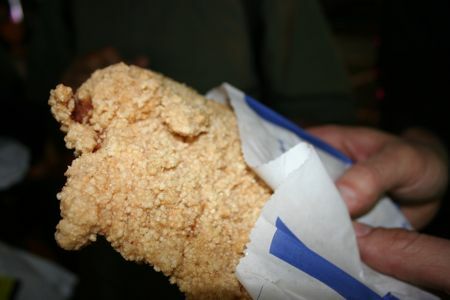 One of those staple snacks of Taiwan. You can guess what’s in it based on the name. 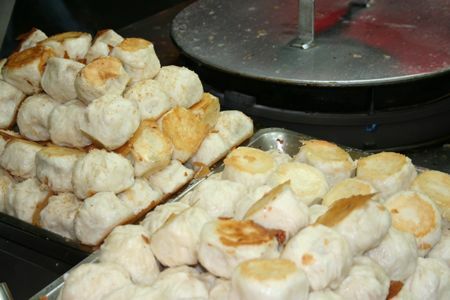 There are a huge variety of them at Shilin night market though. The oyster-to-egg ratio varies; the runniness of the egg varies. I could have devoted a whole separate meal to testing out all the owa jen stands, but when you go to the night market, make sure you try at least one. In case it’s not obvious, I didn’t make it to dessert that night. Next time. 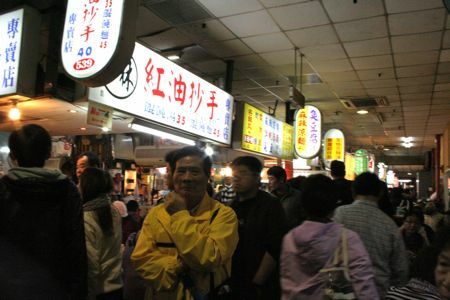 And before someone busts me – no, I didn’t eat stinky tofu that night. Shilin night market. Closest metro station: Jian Tan (red line). Just exit the station and you won’t miss the giant covered tent housing most of the food vendors. Bring wet wipes and arrive hungry. If you’re on a budget, you could happily eat at the night market every day and never get bored. Happy (belated) Thanksgiving to all my American readers! I trust you all gave thanks, over-ate and over-shopped. 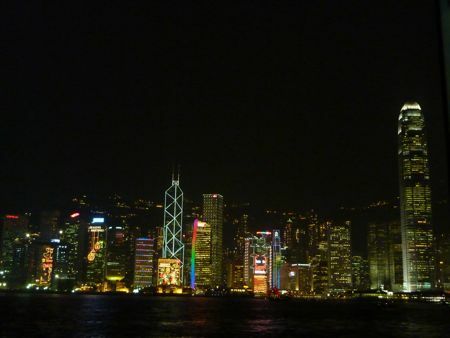 It’s been exactly a week since I’ve returned to London after having spent 9 days in Taiwan and 3 days in Hong Kong. I’m still jetlagged beyond belief, which is yet another annoying sign that I’m getting old. 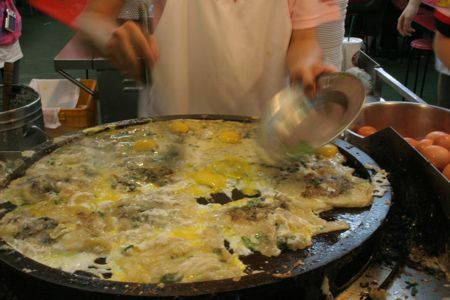 I spent several happy childhood summers in Taipei, Taiwan’s capital city, so take this next sentence with a grain of salt: Taiwan is a *superb* place to visit if you like to eat Chinese food in all its many-regioned glory. Thanks to 50 years of Japanese rule, as well as the ocean bounty that comes with being an island nation, the sushi’s delish, too. There are dozens of direct one-hour flights between Hong Kong and Taipei each day, so the next time you’re planning your fab long weekend in Hong Kong, don’t overlook little ol’ Taiwan. 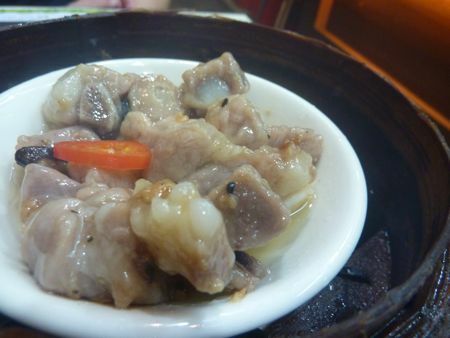 Small eats, xiao chi, is a major aspect of dining out that Taiwanese peeps are justifiably proud of. In every city we visited (and on this trip, we visited Taipei in the north, Kaohsiung and Chiayi in the south, and Yingge on the outskirts of Taipei), storefront shops, street vendors, and stalls in nightmarkets sold, at all hours of the day, xiao chi. 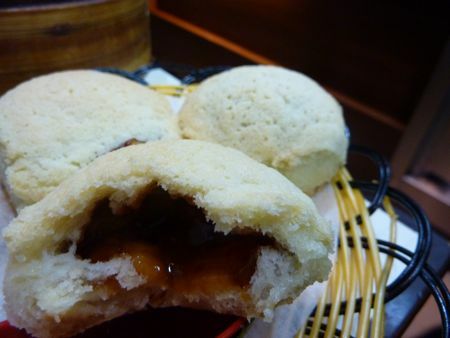 My two favorite examples of xiao chi are gua bao (braised pork belly sandwich in a mantou, a steamed yeast-risen bun) and jien bao (pork-and-soup-filled buns that are steamed and pan fried). 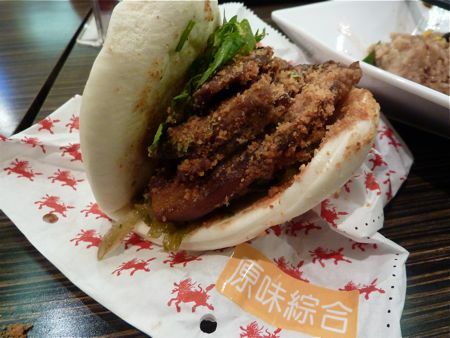 In Taipei, my favorite gua bao was to be found at Shi Jia Gua Bao (special thanks to Taipei local, Wei-Ming, for this tip). 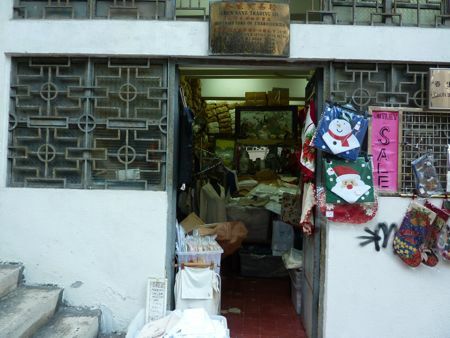 The shop is at 21 Tong-Hua Street, which you’ll find close by the Tong Hua night market. A bite of the melt-in-your mouth braised pork belly filling, garnished with pickled mustard greens, fresh cilantro and crushed peanuts is to experience savory, sweet, crunchy and soft all at once. At the shop, you can order a gua bao that’s mostly fat, no fat, or half-and-half. The best part: each costs NT 45 ($1.50 or 95 pence at current exchange rates. Namely, $1 = 30 NT; £1 = 48 NT). Closest metro stations: Liuzhangli and Da’an (both on the brown line). I could wax lyrical for ages and pages on Taiwan’s xiao chi, but instead I’ll cover more of those in my planned Shilin night market post and move on to restaurant meals. Si Hai Yi Jia, "Four Seas One House"
We ate at a couple of fancy, relatively-pricey restaurants while in Taipei and Kaohsiung, and most of those meals were Chinese banquet style, meaning we’d sit at the table for hours and be served a dozen different courses. It’s an interesting dynamic to be the guest of honor at a Chinese banquet — everyone’s counting on you to eat everything and register appreciation. No pressure, of course. 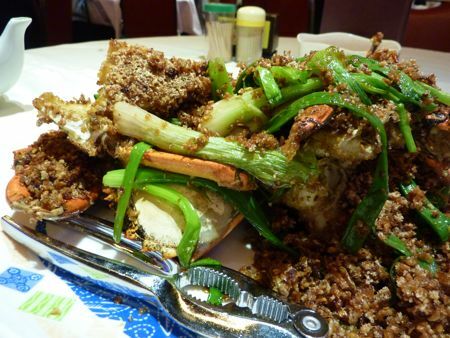 Among the sea of banquet meals, though, the restaurant meal that stands out was at a popular neighborhood place, Si Hai Yi Jia, whose name translates to “Four Seas One House.” Sort of a “we are the world” kind of saying. 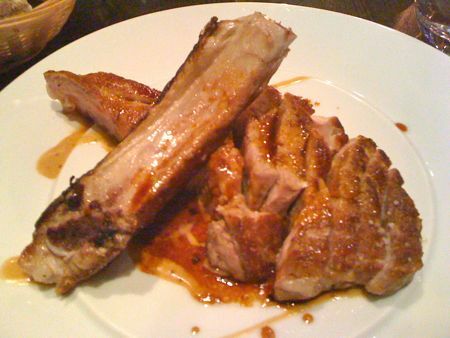 There, we ate some outstanding Beijing duck, dumplings of all varieties, the best scallion pancakes I’ve had in years, and memorably-good sweet-and-tart ribs. 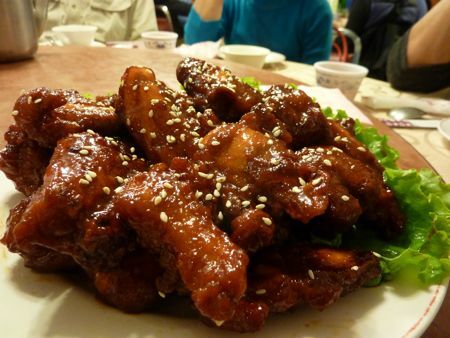 On the Beijing-heavy menu were also delicious examples of local specialties like drunken chicken. I’d highly recommend dropping by this place for tasty, good-quality food in a bustling, casual setting. Also a plus were the servers, who weren’t shy about sharing [strong] opinions (in Chinese, though) on what you should order. 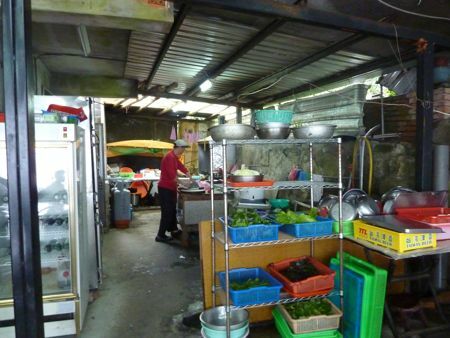 Second-fave restaurant meal in Taipei was actually somewhere in the middle of Yang Ming Shan National park. No lie, though. It’s a pain to get here without a car. We took the underground/MRT to Chien Tan station and then took a 30-minute bus ride to the national park visitor center, followed by yet another 30-minute long shuttle to the restaurant. The only plus side about the journey (which would probably take an hour, total, by car) is how every form of public transportation in the Taipei metro area accepts the EasyCard – a sort of mega Oyster Card. I know this isn’t a food-related tip, but definitely get yourself an EasyCard the minute you get to Taipei. It’s so much handier than (a) having to figure out what the fare is; and (b) digging around for change all the time. The restaurant is no great shakes to look at. It’s basically a shack near the bus stop at the top of a mountain. 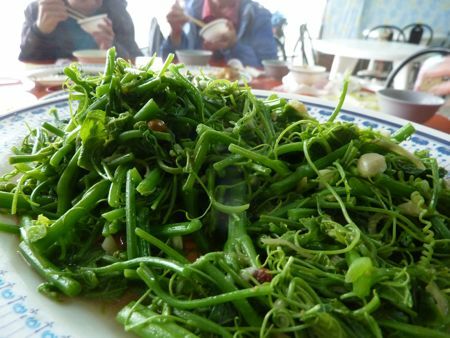 But here you’ll find some of the freshest and most interesting greens of your life. Nothing is cooked until you order, but it comes to the table fast. We loved the fresh mushrooms, braised tofus, sweet yam-and-ginger soup and variety of greens (including a melt-in-your-mouth dish of sweet potatoe shoots). But I will always remember the colorfully-named “dragon’s beard” greens, which were crunchy, slightly sweet and just refreshing. It was great mountaintop eating. Shin Yeh restaurant has several branches in Taipei, including one inside Taipei 101 (which we couldn’t get a reservation for). The resto got a rec in this New York Times article from March 2008, and we ended up at a Shin Yeh location not far from Taipei 101, close to the Taipei City Hall metro station, inside yet another luxury goods shopping mall. The restaurant was huge and decorated in that generic beige look that’s all the rage among luxury hotels around the world. That said, the service was great — attentive and helpful — and the food, while enjoyable, wasn’t anything special (see e.g., Shin Yeh’s version of drunken chicken and their crab-and-sticky rice). 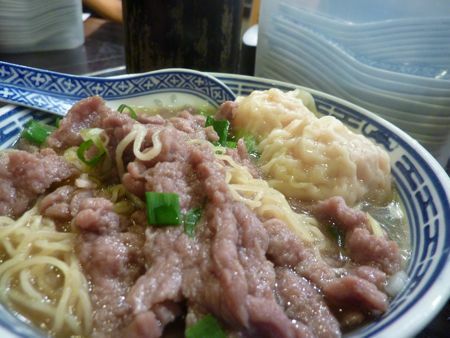 The restaurant’s “thing” seems to be to use good-quality ingredients to prepare typical Taiwanese dishes. Prices are relatively high, but still affordable by US/UK standards. 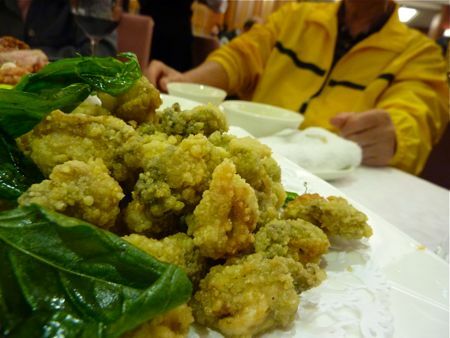 Shout out to Shin Yeh’s fried oysters, though, which ought to be served in bars everywhere. 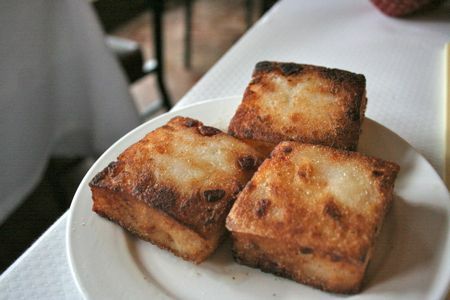 Juicy, briney and battered-and-fried with a deft hand. Probably a nice place to get oriented to local specialties if you don’t speak or read any Chinese, or if you miss the tidiness and calm of a fancier restaurant. Jon and I had an afternoon to ourselves in Taipei (the trip to Taiwan had been to attend a wedding, so most times, we were not alone). So we set out to find premium sushi in a city that claims to have more Japanese restaurants than any city outside of Japan. Cue Mitsui, which I’d read about on London Eater’s site earlier this year. It sounded delicious, high-end, but cheap by London standards. 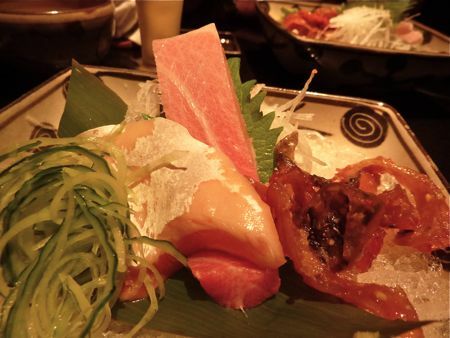 We ordered a lot of items a la carte, and strangely, the sashimi was underwhelming. Maybe we went on a bad day, but my fatty tuna was still part-frozen, rather than silky-smooth, melt-in-your-mouth. The salmon belly had a slightly better (less frozen) texture, but it was flavorless. Grr. Jon and I did better with the “cooked” items like grilled eel, but that’s so wrong in a sushi restaurant with a great reputation. Service was nice, and the room is sleek and chic in all black. But we ate much better sushi when we were in the southern port city of Kaohsiung (if you’re down there, the horribly-translated-into-English restaurant “Sea World” serves some mean sashimi). At least our meal cost only 2600 NT (£28/$43 each), including drinks. 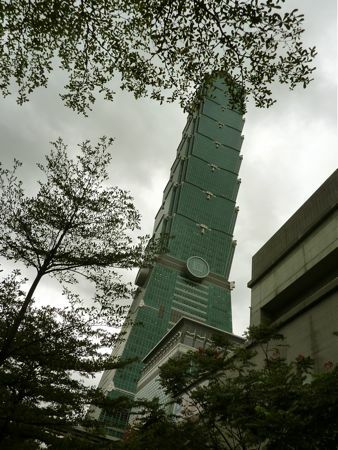 Mitsui, No 30, Nong-an St., 1F Taipei City, Taiwan; +886 (02) 2594-3394; closest Metro: Minquan West Road (red line). 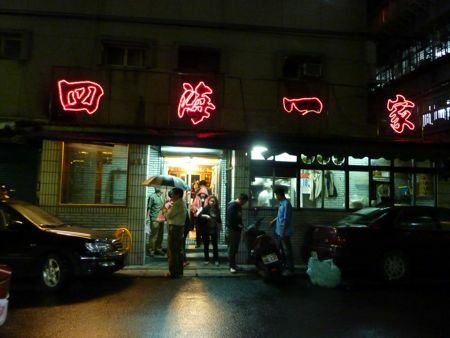 This September 2008 NYT article also gives a handy overview of the joys of eating out in Taipei. 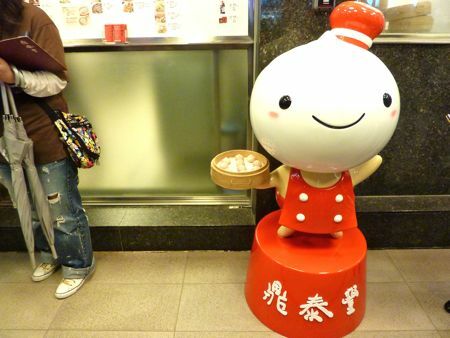 To read about *the* Din Tai Fung restaurant (and rival Kao Chi), click here. Din Tai Fong (XinYi Road branch) in Taipei - merchandised? Nah. First, you spot the crowds on the sidewalk. Then you spot the xiao long bao cartoon character. This is ﻿Din Tai Fung. 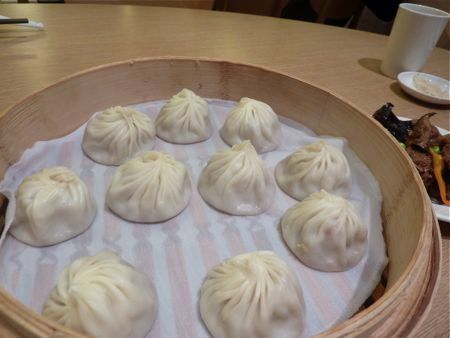 Last week, as part of a 9-day trip eating my way through Taiwan, I visited the original Taipei location of what can only be called a xiao long bao empire. 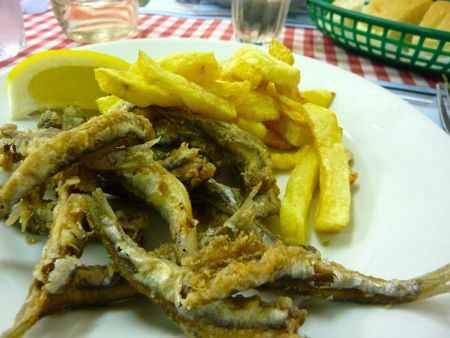 The place is fabled among locals, tourists and food lovers around the world, it seems. 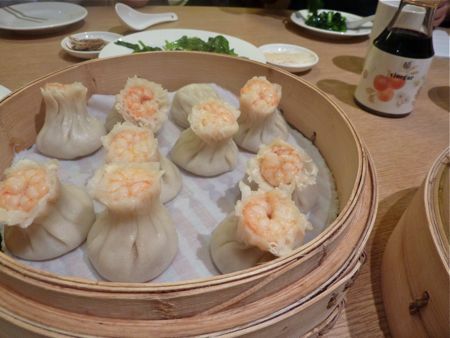 For background on Din Tai Fung and a sense of the adoration this place inspires, read this. (Also, loosely related, but highly entertaining, is this October 2010 NYT Magazine article touching on food-crazed people and XLB). In any case, our party of eight arrived at Din Tai Fung for a weeknight dinner, and we were mildly alarmed by the number of people already spilling out of the restaurant (Din Tai Fung takes no bookings – ugh). 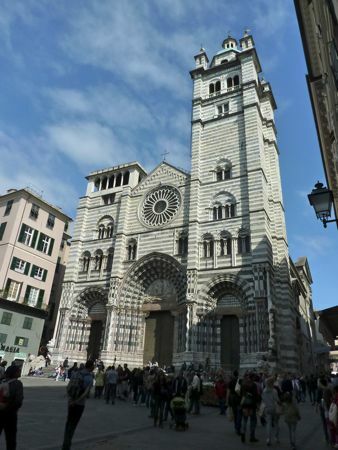 Luckily, this place isn’t written up in every guidebook and travel article for nothing. These people have a system! The ladies in headsets hand you a number, a menu and an order form so that while you’re waiting for a table, you can tick the boxes comprising your order. When your number’s called, you hand in your order form, and seemingly by the time you’ve reached your table (the place is surprisingly large, though maze-like), dishes have started arriving. We were in and out in less than an hour. Don’t even think about lingering. 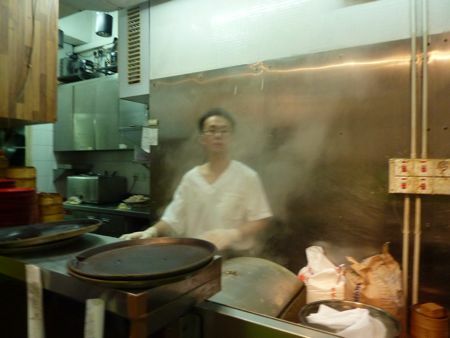 While waiting for our table, I peeked into the kitchen, which is towards the front of the restaurant. 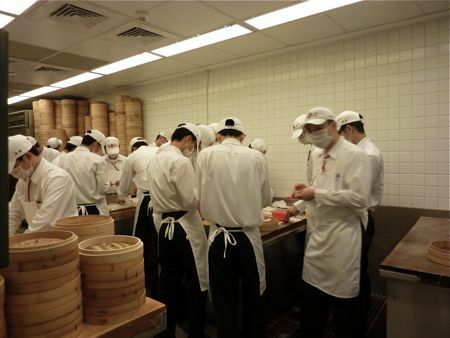 The room was oddly silent except for the hissing of steamers cooking what must be hundreds of thousands of xiao long bao a day. There must be a high incidence of carpal tunnel syndrome among the cooks when you consider the number of delicate pleats that go into each xiao long bao. Onto the star attraction. Deflated. Seriously. The skin is perfect, almost-translucent but strong. The visual appearance isn’t bad (but it’s not great). But here’s the failure: the bottoms aren’t sagging with soup. We ordered four baskets of different xiao long bao, and none of them were especially soupy. I like my xiao long bao to be so full of soup that when you lever them gently into your soup spoon, you feel like a kid playing a type of carnival game (“don’t break the skin/leak the soup”). These guys were so lacking in soup that you could pretty much throw them around like softballs without worrying about leakage. We tried a lot of other dishes at Din Tai Fung, and unsurprisingly, most of them were comprised of the same ingredients that go into XLB. 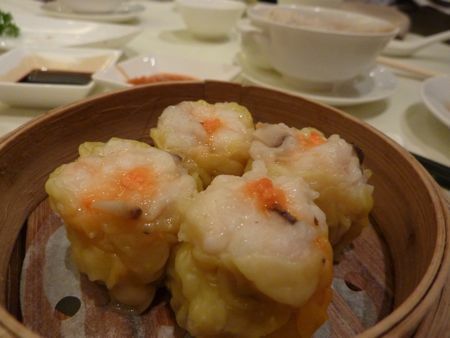 The shu mai, for example, even looked like XLB, but were topped with prawns. Efficiency at work. But it’s not shu mai. Get the chicken soup, though. It’s amazingly rich and flavorful. While the Din Tai Fung XLB disappointed because of their lack of soupiness, they were still tastier than anything I’ve found in London. (Leong’s XLB used to be better when they first opened, but lately it just barely satisfies a craving). And at 190 NT ($6 or £4) for a basket of ten “regular” pork-only xiao long bao, Din Tai Fung won’t break the bank. I’d say make the pilgrimage the next time you’re in Taipei, but in my opinion, the better XLB experience is to be had at nearby Kao Chi, which we visited the next day mostly because we were doing some shopping in the area (the housewares department at Sogo Fuxing branch is unbeatable if you’re looking for high-quality, attractive rice bowls). Credit to A Hungry Girl’s Guide to Taipei, which was handily organized by MRT station so that once I knew we were headed to Sogo, I could quickly scan for nearby dining options. (Something I should consider doing on my own blog except for the admin hassle of re-doing the archived posts). Kao Chi was not only calmer and more upscale looking than Din Tai Fung, but also its XLB were, happily, soupier and better seasoned (i.e., I didn’t need to rely on soy sauce and vinegar). The skins weren’t quite as translucent as those at DTF, but they were still thin and delicate, and I’ll trade a slightly thicker skin for more seasoned soup broth any day. So go to Din Tai Fung to say you’ve been there, but don’t forget to drop by Kao Chi for a better dining experience, both in terms of food and atmosphere. 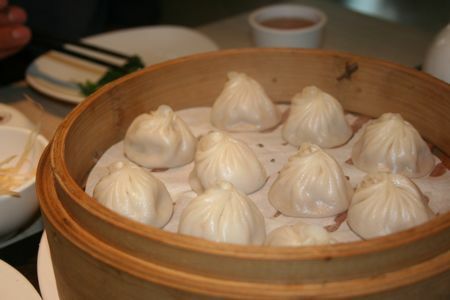 Din Tai Fung, 194, Xin Yi Road Sec. 2 (cross street: Yong Kang Street), 10651 Taipei, Taiwan; +886 (0)2 2321 8928; closest MRT station: Daan Station (brown line).